Concept: Provides a convenient way to book home cleaning services online from a phone, tablet or computer, connecting clients to cleaners in minutes. By bringing technology into the process, Sweep South aim to modernise the domestic cleaning services industry. How the business idea came about: We struggled to find a suitable, temporary domestic cleaning service while on holiday at the end of 2013. As a result of my first-hand experience, I conceived the SweepSouth vision in that I saw an opportunity to fill a much needed gap in the market. For Aisha Pandor, co-founder and CEO of SweepSouth, there has never been a better time to shine. The principal idea behind SweepSouth, an on-demand, online domestic cleaning services company, was formed when Aisha Pandor, former molecular geneticist and management consultant, and her husband, also a co-founder; struggled to find a suitable, temporary domestic cleaning service while on holiday at the end of 2013. ‘Although I come from a scientific research background, I have always had a passion for striving to make an impact in a meaningful way. As a result of first-hand experience, I conceived the SweepSouth vision in that I saw an opportunity to fill a much needed gap in the market. I was determined to revolutionise, and create the ‘Uber’ of domestic cleaning services’, Aisha states. With no better time to shine, SweepSouth was launched in June 2014. This vision has since developed into a highly-polished reality with the establishment of a web-based platform that offers a combination of skills and provides a reliable, hassle-free service. ‘Essentially, SweepSouth provides the platform to connect cleaners with those who require a part-time domestic service. Demographic studies reveal that our primary target group ranges between the ages of twenty to mid- forties,’ Aisha reveals. 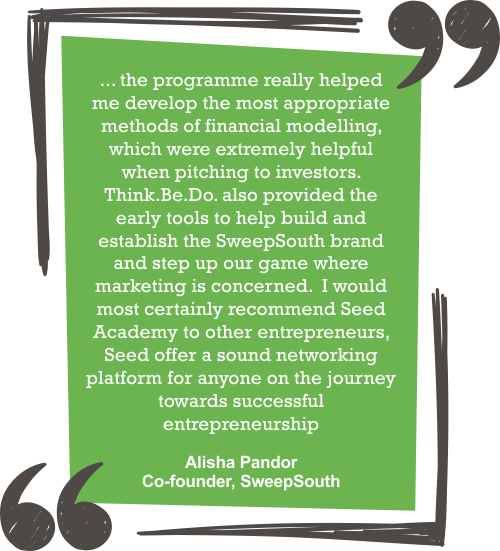 ‘Upon launching SweepSouth, it was while searching online, seeking to connect with like-minded entrepreneurs, that I discovered Seed Academy,’ Aisha confirms. ‘In August 2014, I first began to experience the value of what the Think.Be.Do. programme has to offer. I found exactly what I was looking for in the form of an ideal platform to connect with and build relationships with like-minded entrepreneurs. What I learnt from the programme really helped me develop the most appropriate methods of financial modelling, which were extremely helpful when pitching to investors. Think.Be.Do. also provided the early tools to help build and establish the SweepSouth brand and step up our game where marketing is concerned. I would most certainly recommend Seed Academy to other entrepreneurs, Seed offer a sound networking platform for anyone on the journey towards successful entrepreneurship,’ Aisha maintains.